« William Kentridge – No it is! 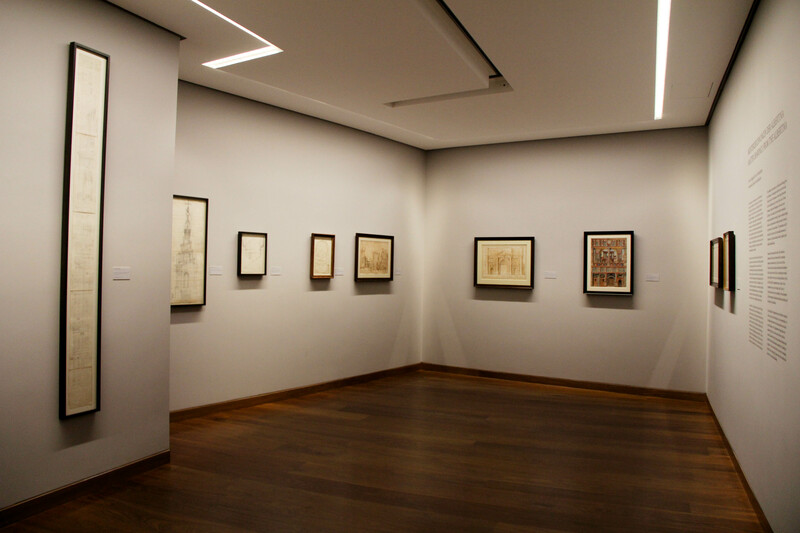 title Architectural Master Drawings from the Albertina. location Tchoban Foundation, Museum for Architectural Drawing Christinenstraße 18A, 10119 Berlin. 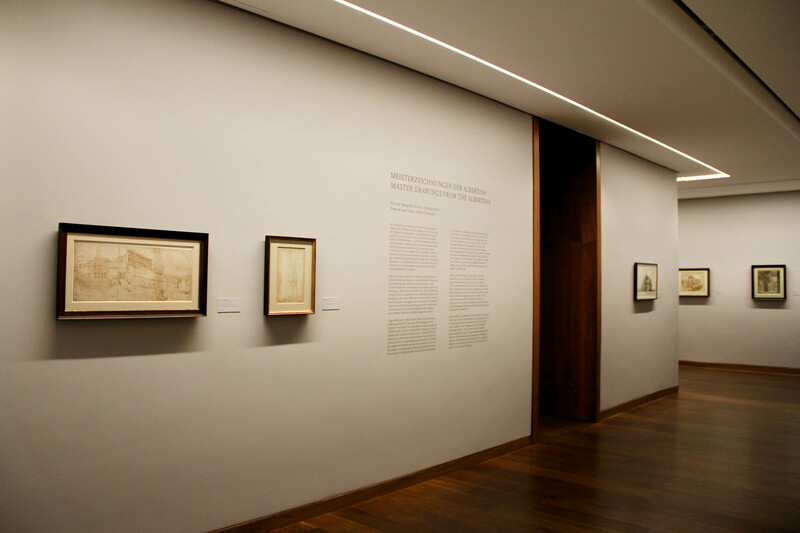 subject Architectonic hand drawings from both the Architecture and the Graphic Collections of the Albertina museum in Vienna. objective/ focus Give an insight into a collection of hand drawn architecture of renowned artists and present both the historical development of the Albertina’s Architecture Collection. target audience Architects, designers, artists , or basically anyone interested. curators Director of the Albertina’s Architectural Collection, Dr. Christian Benedik. museal Available original objects of a collection. current Reference to contemporary thinking. didactic Originals with the aim to explain a story/context. contemplative Offerings and spaces for tranquil inspection and calmness. object Presentation in different picture frames, mostly i gray-black tones, prior-decided from Albertina Museum with a special security system attached to their back. staging Equally transmitted light, Color of the walls painted in order to fit the concept and to showcase the paintings, color of exhibit labels same as the wall. thematic structure Chronological, selection of masterwork categorized according the artists, offering diverse examples in the field in terms of technique, geometry, art, history and theory. visitor management Round tour, guided tour if requested. accessibility Fully accessible, elevator connecting all the levels of the building. communication concept Texts, language: english-german. Typography follows the corporate identity of Tchoban Foundation, legends and exhibit. color concept Light grey, wooden parquet floors. lighting concept Linear led lighting offers a harmonious lighting and doesn‘t affect the structure of the paper , indirect lighting, dimmed for conservation reasons and to reduce glare. Linear led lighting is one of the buildings concepts. exhibition construction Repaint the walls. System for the exhibit fixation. exhibit fixation Exhibits hanged by hooks on the back of their frame attach to „L“ hooks on the museum wall. At the bottom center of the painting, a metal boiler plate screws into both the frame and the wall. The frames include an individual security system for each painting. print production Printed exhibit labels, explanatory wall text when entering the room in same font. conservations aspects No direct lighting, security and preservation system through the frame. durability This exhibition is a temporary exhibition. However the exhibition is optimally designed for its purposes. appearance,aesthetics,beauty Good overview of the artworks, clean and simple exhibition design with focus on the paintings, drawings, sketches. Color of the walls/labels in harmony with the wooden floors. It fits the minimalistic concept of the whole building. adequacy of resources The nature of the Tchoban Foundation Museum’s gallery spaces only allow for a select choice of architectural masterworks to be exhibited. logic of allocation Organisation according the artists and chronologically gives a good overview of the different architectural concepts/idea/techniques developed from the 15th century till the present days. What is the occasion of the exhibition? The historical development of the Albertina’s Architecture Collection in Vienna. The Albertina is one of the most prominent collections of the world with over one million works covering six centuries of art history, from the late Middle Ages and the Renaissance to the present day. What are the most important exhibits? Paul Eduard Sprenger (1798–1854) Interior perspective of a design for the Military Exercise and Industrial Exhibition Hall in Vienna,1853. Pencil, watercolor. Albertina, Vienna. Otto Wagner (1841–1918). Front elevation of the main façade of Berlin Dome, 1891. Pen- cil, black ink. Albertina, Vienna. Zaha Hadid Österreich, Wien, Projekt für Donaukanalbebauung Spittelau, Perspektive, 1994, Gouache auf schwarzem Papier, Albertina, Vienna. Are those being presented adequately? There is not particular differentiation in the way these exhibits are presented. During the guided tour these 4 among several others were highlighted. Especially the Interior perspective of a design for the Military Exercise and Industrial Exhibition Hall in Vienna from Paul Eduard Sprenger has been chosen as the main picture for the advertisement mediums (flyers, posters) of the exhibition, putting an extra focus on it. How is the interaction between individual parts and the entirety? They harmonize perfectly due the colors and the materials used. What role do the objects play? Each exhibit is unique. They offer diverse examples in the field of architecture in terms of technique, geometry, art history and theory. How are meanings being communicated? With the exhibit labels and the introductory wall text in the beginning of each room. How does the dramaturgy take place during the exhibition? The exhibition has a clear structure and let the visitor experience a story through the history of architectural drawings from known and unknown artists. The visitor through the lighting and the closed spaces stay completely focused. How are the topics and contents being transported? The order of the exhibits shows the evolution of use of color and graphic techniques. What are the key elements/which knowledge can be gained? An understanding and a historical evaluation of the methods used at that time. The exhibition is really important in terms of theory of architecture or art history. The exhibition is a useful source to visually compare the relationship between architectural hand drawings and architectural theory from the 15th century up to the present time. Is it worth a second visit?